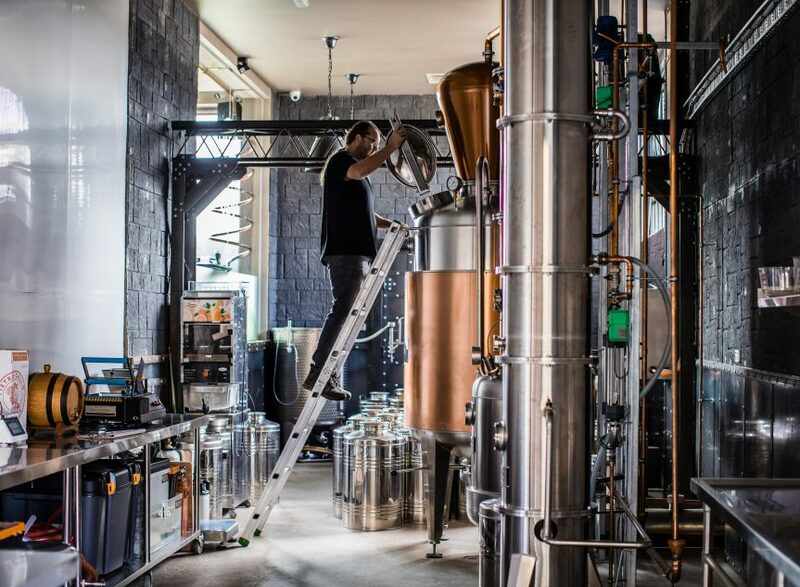 Through the eyes of Nathan Rigby – Head Distiller. The drive. As I drive up the winding road leading to the estate I can sense spring is upon us, the air is crisp, the kangaroos are posed in the nearby field and I feel damn lucky to work in such a serene place. Citrus in the air. Today we are making this season’s batch of orange liqueur, Liquore all’Arancia. As I help the distillery team setup and fine tune our citrus zesting machine, the smell of oranges triggers distant childhood memories of summer. I can’t help but recall the conversations I had with our grower and hearing the passion in his voice about his fruit. ‘No sprays, no wax and only picked when completely ripe’. You can’t buy these from the supermarket, they are the most ripe, vibrant oranges I have ever seen. A few minor adjustments later and our citrus zester is tuned to perfection. The secret to making great citrus zest liqueurs, is to only remove the zest. If any white pith is removed in the process, an undesirable bitterness is present in the final product. Our machine gives us great control and it’s always satisfying seeing a two-meter ribbon of zest being removed in one pass. Walking the orchard. Once the team have found their groove, I take a walk through our Estate citrus orchard with John (our Founder) to once again check the progress of our lemons. It is almost time to make our fabled Limoncello Classico. The lemon oils are accumulating in the zest nicely, and they smell amazing. Not long now. A little distraction: As I return to the distillery, the growing mass of orange zest collecting in the tank creates a rather captivating image. First coffee for the day. After staring briefly into the orange abyss, I move my attention onto coffee, well to be exact, Grappa and coffee. This beautiful union has been tried and tested throughout the ages as a Caffè Corretto and we have developed our own unique take on this wonderful combination. It is time to make the final touches to the current batch of Grappa al Caffè. This involves adding our estate produced grappa to freshly prepared cold-drip coffee. The proportions must be precise. With more than 50 iterations spanning over 18 months, our pursuit of the ‘perfect combination’ was realised. The depth and character we trained from our Grappa and freshly roasted coffee beans is something else. Tour preparation. As the afternoon draws to a close I make sure the distillery is looking pristine for our distillery tour tomorrow. I am far from a natural tour guide, but I look forward to sharing with our guests the art and science of grappa distillation, and introducing them all to our grappa still, Scarpone. Batch done and dusted: Late afternoon sees time spent on emails, paperwork and reflection. I have just closed the production file on the 2017 vintage of our Grappa di Prosecco. Bottling has just finished and the tank is dry. Just over a thousand bottles. Making excellent grappa is hard work and unlike most other spirits, our production is limited by the seasons. Riding the tail of the wine vintage, we only get the privilege of making grappa 2 months of the year. But herein lies the beauty of grappa and the quest to capture the subtle seasonal variations and expressions of the vintage. Goodnight and sweet dreams: I whisper a ‘goodnight’ to Scarpone and lock down the distillery for the night. I leave to the lingering smell of orange zest and smile to myself as another creative and successful day in the distillery is complete and the hope of the same tomorrow.